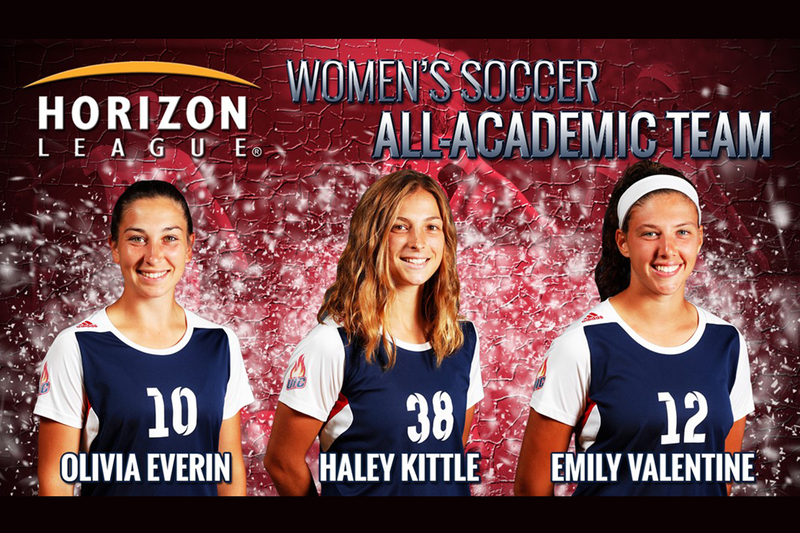 Seniors Olivia Everin and Haley Kittle and sophomore Emily Valentine earned a spot on the Horizon League Women’s Soccer All-Academic Team. The Flames led the League with three of the 13 honorees. Michigan, native leads the team with four assists and 36 shots. With a 3.91 GPA as a biochemistry major, Kittle collects the Academic All-League honor for the second time in her career. The Rockford native came back after sitting out last season because of an injury to play in all but four matches this year. She has aided UIC at both ends of the field and has nine shots with four on goal. Valentine picks up the honor in her first year eligible as she has a perfect 4.0 GPA as an economics major. A Rockford native, she is one of three to start every game this season, recording the second-most minutes (1,288) while helping the back line secure four shutouts. She ranks second in goals (3), and third in shots (24) and shots on goal (11). athletes must participate in a league sport, have completed a year at the member school and passed 24 semester hours at that institution before the start of their athletic season, and have a cumulative GPA of at least 3.20 on a 4.00 scale.